Run Jen Run: Beginner Blog: What is Conversation Pace? Back in high school, my cross country coach used to tell us to go run at “conversation pace” all the time. The term was also used often during the RRCA certification course I took last month saying that 75-80% of your weekly mileage should be done at conversation pace. So what exactly does that mean? Think about a normal run for you. Are you breathing heavily and struggle to get any words out? Or are you relaxed, breathing easy and feeling good? Conversation pace is that relaxed, breathing easily, feeling good kind of run. It’s the pace you can run and hold a conversation or even sing a song at submaximal effort. Most runners tend run too hard, too often. “If I am pushing myself to the limit every day, I will get faster in a race. Right?” Wrong. High intensity running on an everyday basis will get you injured and/or burnt out very fast. Don't get me wrong—it can also be difficult slowing yourself down but it will pay off in the long run. 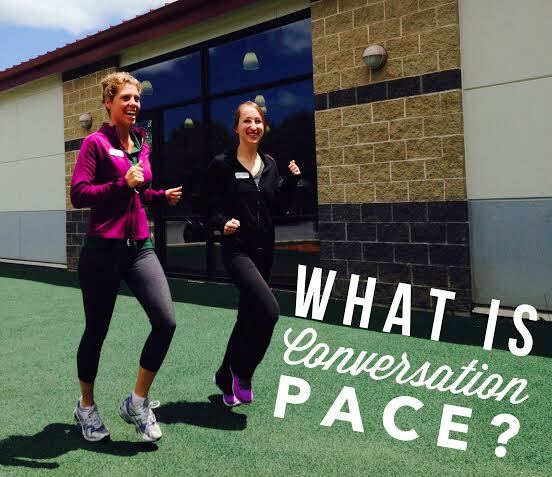 What are some benefits of a conversation pace run? How can you make sure you’re not pushing yourself too hard? At various points during your run, do a little talk test. If you can’t spit out a sentence or two, slow it down. Walk a little if you have to. Chances are you’re heart rate is too high and you have crossed over into that anaerobic training zone where lactic acid starts to build up and fatigue sets in quicker. When is conversation pace not appropriate? Speed work, hill workouts, tempo runs, or races where you can expect to step outside your comfort zone a little bit. Running should be enjoyable. If you are a newbie runner, you may feel like you are struggling but don’t make it any harder on yourself then it has to be. Remember “conversation pace” and have fun out there! Excellent summary. After 5 years of running, I still struggle to keep my easy days easy. Sometimes I sing out loud to test my pace. The Brady Bunch is a good test for solo runners.